Piping hot rasam and rice with some ghee on top of it is one of my favorites especially on cold winter days. There are different versions of tomato rasam. 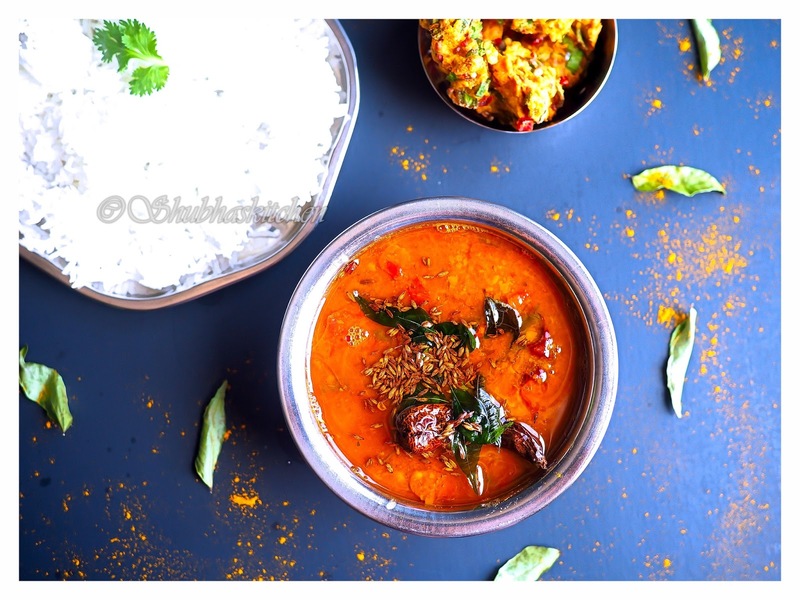 I like the way my mom makes rasam and hence I have always been making it her style. Every time I go to India , my mom makes fresh rasam powder for me which I store in the refrigerator. But after a while , when I have used up all the rasam powder made by her, I make my own fresh rasam powder (obviously using her recipe:)). 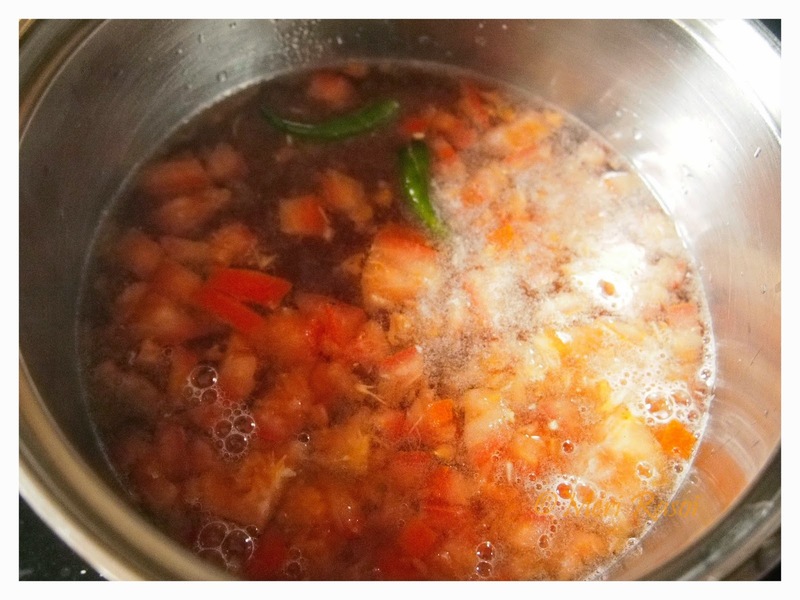 It's easy to make and I make it fresh each time I make rasam. 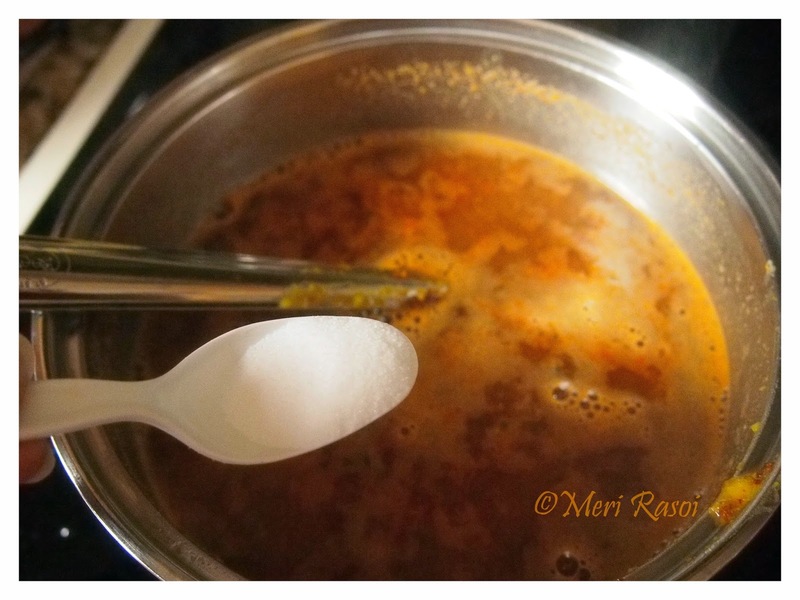 In today's post I will share the recipe of making Rasam (my mom's style) along with the recipe for her rasam powder. Wash the lentils. Add 3/4 cup water to them. Add turmeric powder and pressure cook the lentils . Once done set it aside. While the lentils are cooking, soak tamarind in some hot water. Now lets start preparing the rasam powder. Heat 1 tsp of oil. when hot, fry the red chillies. Set it aside. 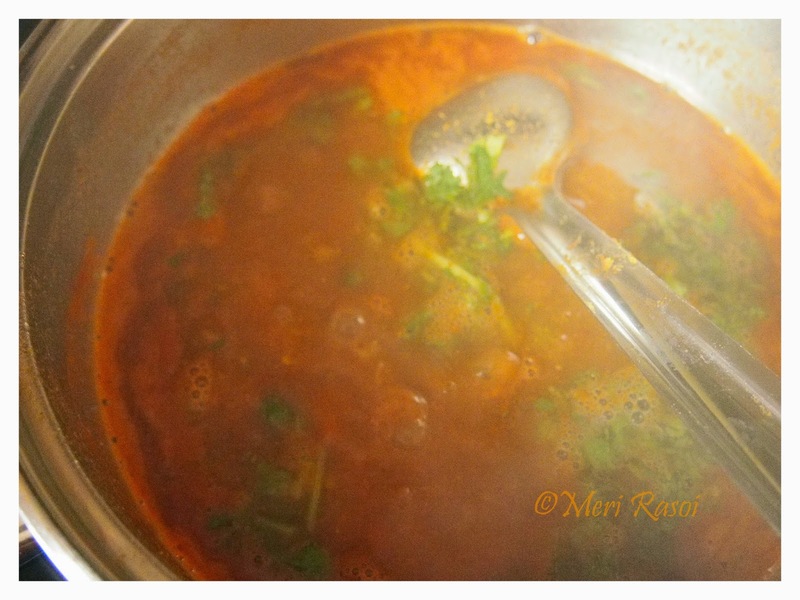 In the same pan, add 1 tsp of oil and add the fenugreek seeds, cumin seeds, coriander seeds, asafoetida and curry leaves. Fry the ingredients until the seeds start to splutter. Set it aside. 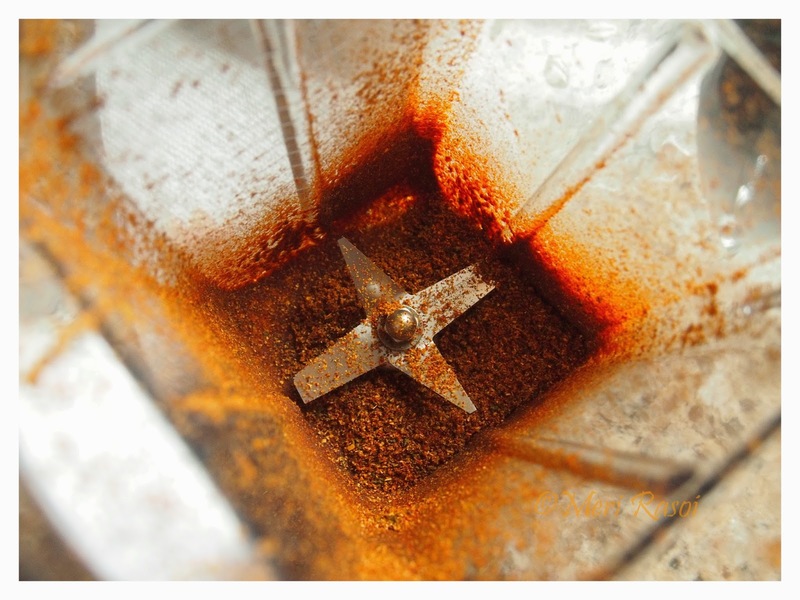 Once all the ingredients have cooled, grind them into a fine powder using a dry grinder or coffee grinder. 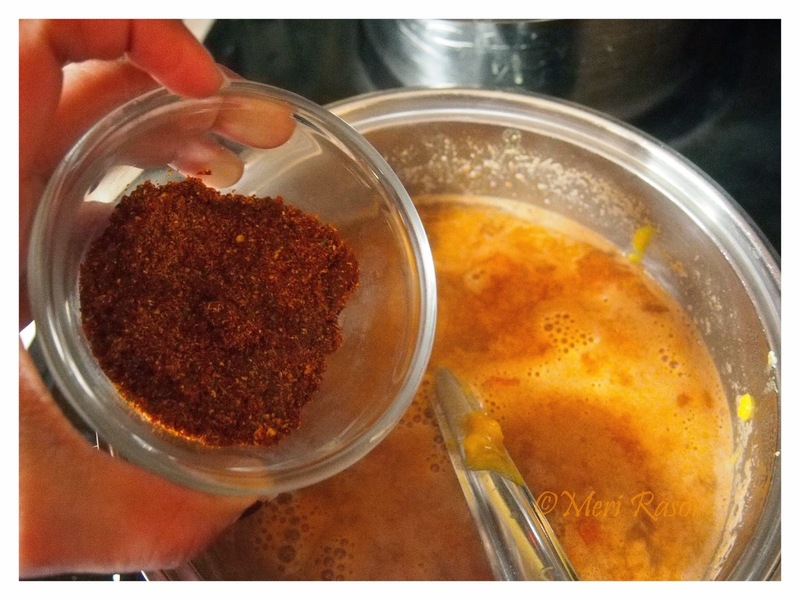 Rasam powder is ready. Boil 2 cups of water. To this, add the chopped tomatoes and green chillies. 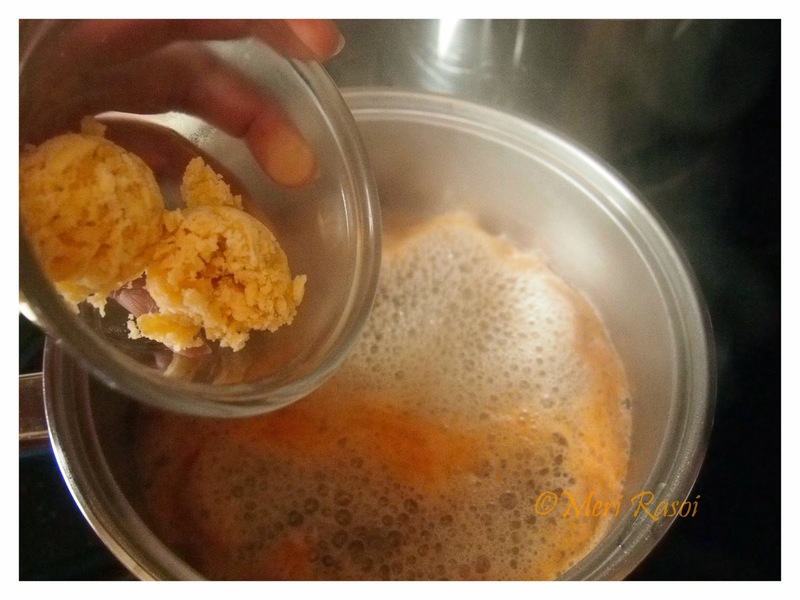 Mash the tamarind and extract the tamarind pulp. 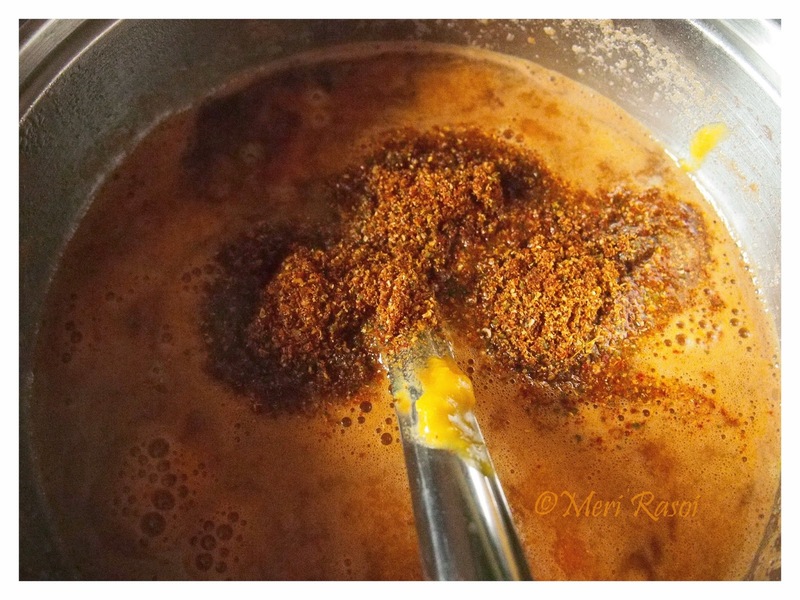 When the tomatoes turned soft, add the tamarind pulp and powdered jaggery. Cook for 5-7 minutes. 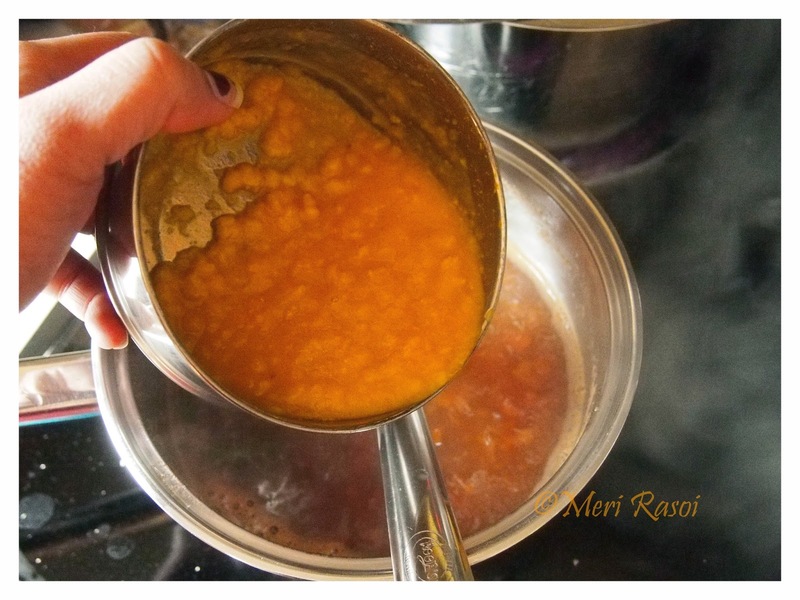 Whisk and add the cooked lentils and the prepared rasam powder. Mix well. Add salt. Bring it to a boil and then simmer for 10 minutes. Add the chopped cilantro and turn it off. Now to prepare the tempering, heat ghee in a pan. 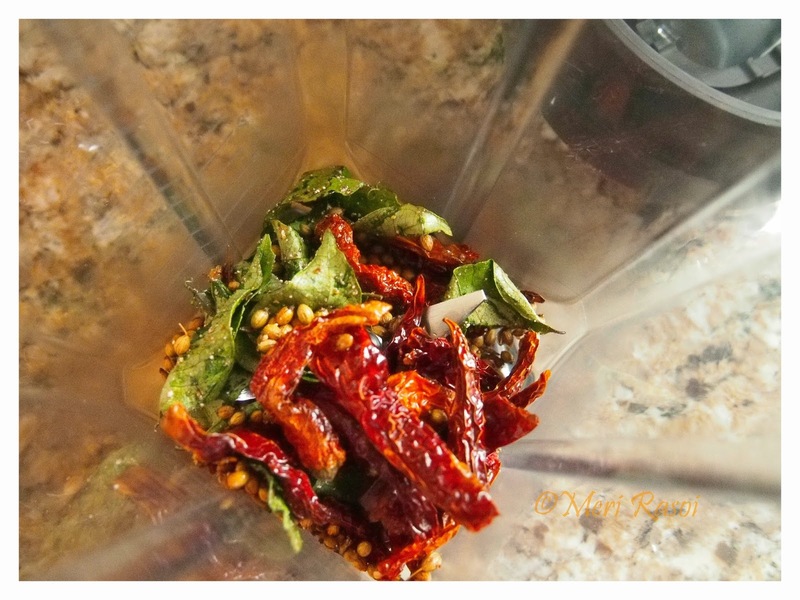 When hot, add the cumin seeds, mustard seeds, broken dried red chillies and curry leaves. 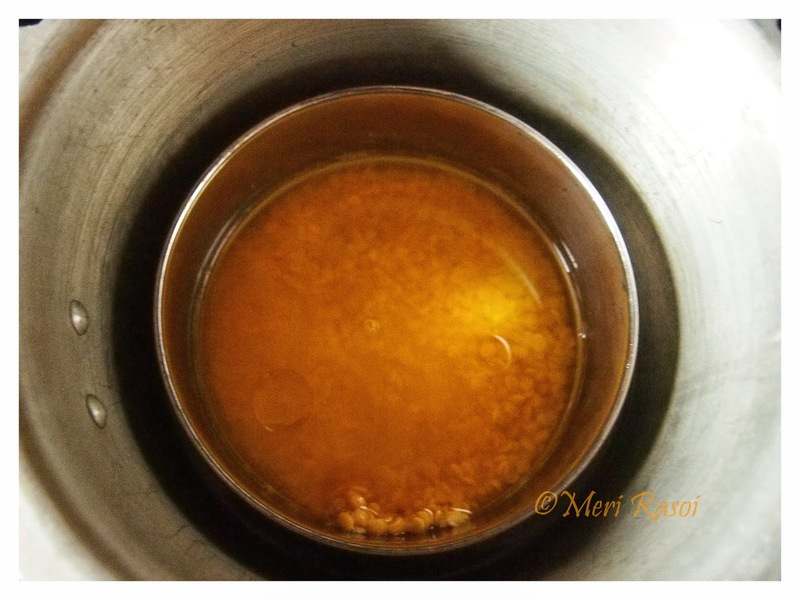 When the seeds start to splutter, add the tempering to the hot rasam. 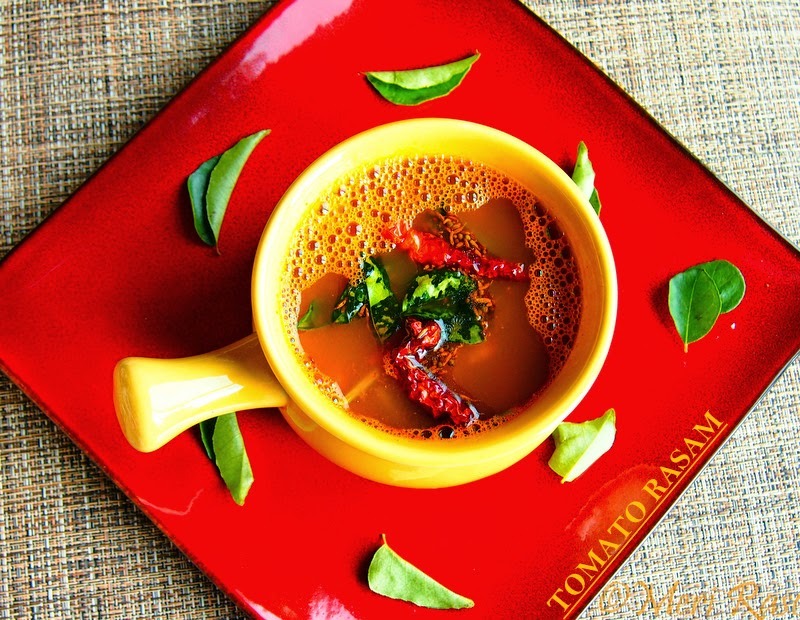 Serve piping hot rasam as a soup or with rice and some Papadam / papad. A wonderful recipe, mum's & granny's recipes are always very special, aren't they? Delicious. Beautiful clicks as always! This looks so delicious and tangy!!! I'll be on n off here for a while, sorry for missing some of your delicious recipes!!! looks super super good Shubha. 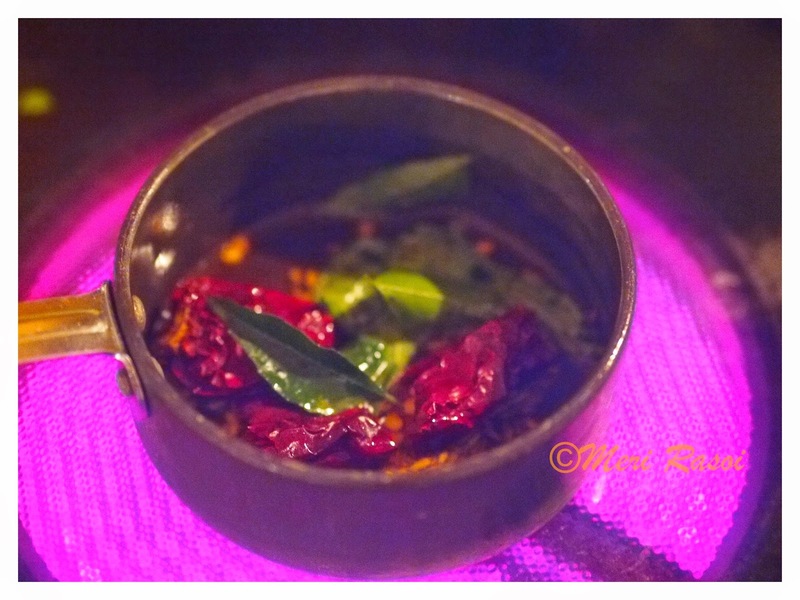 When I cast my eyes on the rasam powder, I felt as though I could sense the aroma!! Gosh!! What you said in the first sentence already making hungry. Yes with ghee and this rasam - all the time and must have fav. Meri Rasoi, this something totally new to me! It sounds absolutely delicious. I have been surfing through your blog! Beautiful recipes! 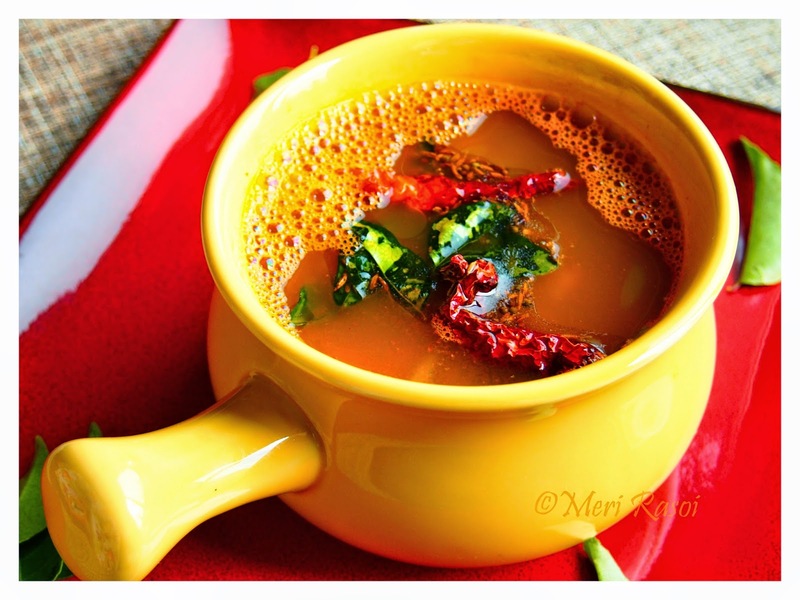 What a fabulous, aromatic, flavorful & a perfect rasam recipe!! Love the crackly curry leaves and red chillies for garnish. 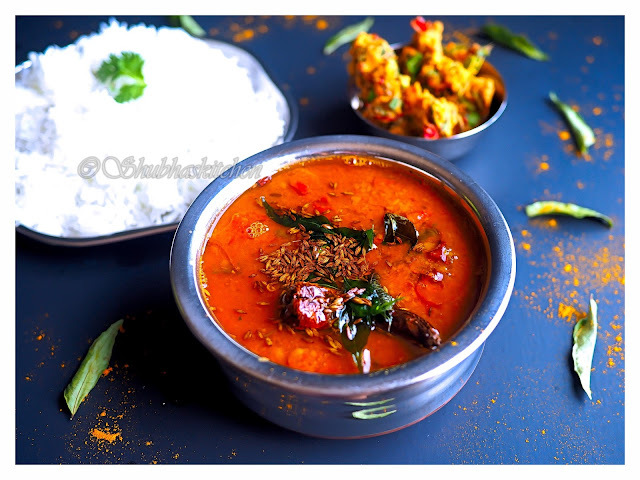 How much of the Rasam Powder do we use for making this Rasam? 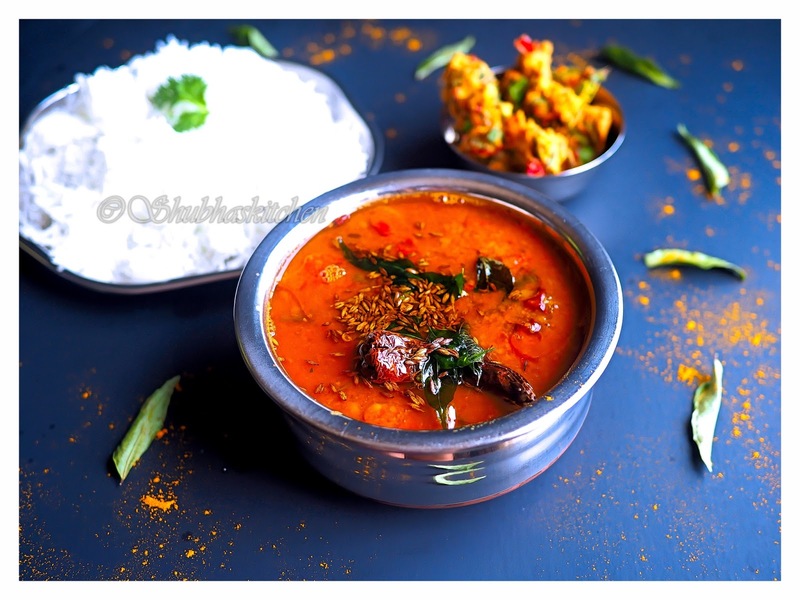 All of the Rasam powder as per recipe or reduced amount? Will be nice to know the exact amount.